An article by 'Mose' (Fred Moseley) published late 1978/early 1979 in Root & Branch magazine (No. 7). Summarizing from a Marxian perspective the most important factors determining the structure of the economy, Mose concludes that both the squeezing of workers' living standards and government economic interventions can, at best, only prevent a sudden collapse of the system. The world has been slow to realize that we are living this year in the shadow of one of the greatest economic catastrophes of modern history. But now that the man in the street has become aware of what is happening, he, not knowing the why and wherefore, is as full today of what may prove to be excessive fears as, previously, when the trouble was first coming on, he was lacking in what would have been a reasonable anxiety. He begins to doubt the future. Is he now awakening from a pleasant dream to face the darkness of facts ? Or dropping off into a nightmare which will pass away ? These words were written by John Maynard Keynes in 1930, at the beginning of the Great Depression. Unfortunately, the "darkness of facts" to which Mr. Keynes referred turned out to be far worse than anyone in 1930—either "the man in the street" or the wise Mr. Keynes himself—had imagined. No one expected the fifteen horrible years that lay ahead—ten years of deep and unremitting depression that finally resulted in another five years of global warfare. President Hoover confidently declared in a speech to the U.S. Chamber of Commerce on 1 May 1930: "I am convinced we have passed the worst". But, the striking feature of the Great Depression was that the "worst" continued to worsen. What looked one day like the end of it proved on the next day to have been only another beginning. Now the 1970s can be added to Keynes' list of modern economic catastrophes. The combination of the highest levels of unemployment since the 1930s and unprecedented double-digit rates of inflation has brought a sudden end to the "post-war prosperity" of the 1950s and 1960s. Instead of prosperity, we now have austerity. For most people in the 1970s, things are no longer getting better; living standards are no longer improving, as they did in the 1950s and 1960s. For some people, particularly those unemployed or with fixed incomes, things are clearly getting worse. Therefore, it seems reasonable and increasingly urgent for those of us who are standing in the street in the 1970s to consider the same question raised by Keynes in 1930. To paraphrase Keynes: Will the current nightmare soon pass away ? Or, are we awakening from a pleasant dream to face an ever greater darkness of facts ? In other words, are we headed for another depression, similar to that of the 1930s or even worse ? That possibility, unthinkable though it may be, should nonetheless be seriously considered. The misery that lay ahead for the man in the street in 1930 was no doubt just as unthinkable to him. In the following pages, I will discuss this question—are we headed for another depression ?—using the Marxian theory of capitalism as a general theoretical guide to the nature of the current crisis of world capitalism. What I have to say is divided into three parts. First, I will describe the most important features of the current crisis which must be explained if we are to assess whether this crisis will persist and deepen into yet another world capitalist depression. Then, I will present a brief summary of Marx's theory of capitalist crises. Finally, I will discuss what Marx's theory tells us about the severity of the current crisis and the likelihood of recovery. One very important characteristic of the 1970s, which is most responsible for the general economic malaise, is a world wide decline in the pace of capital investment (i.e., a decline in the rate at which money is invested in capitalist enterprise from year to year). The rate of capital investment is the single most important factor in determining whether capitalism is in a period of prosperity (as characterized by fuller employment) or in a period of depression. The number of jobs available rises and falls with the pace of capital investment. If capital is being invested at a faster than average rate (i.e., businesses are expanding their operations and hiring additional workers at a fairly brisk rate), then there will be relatively more jobs available and unemployment will decline. If, on the other hand, the rate of capital investment slows down or ceases altogether, unemployment will rise as fewer additional jobs are created and maybe even more jobs are eliminated (as happened in 1932, when there were 20% fewer jobs than in 1929). The fact that the alternating conditions of prosperity and depression in a capitalist society depend on the rate of capital investment is just another expression of the general dependence of the working population on the owners of capital. The best we can hope for, in capitalism, is that the owners will invest enough capital to hire us all. Of course, even when this is the case, we still have to spend eight hours a day, forty hours a week, working for the owners of capital, who have purchased our labor. This usually turns out to be unpleasant and sometimes downright dangerous; but, at least, then we have some money coming in and don't have to worry about month-to-month economic insecurity. In a depression, however, even these few carrots are taken away and nothing is left but the stick. In such "hard times", the majority of the population suffers drastic cuts in its living standard because the rate of capital investment has slowed down or ceased altogether. In the 1970s, there has been a marked decline in the pace of capital investment all over the capitalist world. The rate of capital investment dropped off sharply during the "Great Recession of 1974-75" and has recovered only feebly since then. Economists refer to capital investment as the "weak link" or the "missing link" in the recovery from the Great Recession. The overall result is that the pace of capital investment has slowed down significantly since 1973 (as compared to the previous twenty-five years), as can be seen in the following charts taken from a recent issue of Business Week. It is more than two years since the economy emerged from recession, and U.S. business still is not investing in new plant and equipment as it has in past recoveries—or as it must to keep economic activity high and unemployment low. . . Unless the pace of investment worldwide rises soon, the result may be the inflation and recession that so many fear. But the distressing fact is that the level of capital investing in the U.S. is still lower than it was in 1974, with the increase in investing coming more slowly than in any previous postwar recovery. . . Most sobering, capital spending may have already peaked for this economic cycle. Economists are generally forecasting smaller gains in the next couple of years. . . There is no longer any serious dispute that capital spending has become the weak link not only in the U.S. but in the whole worldwide economy. After nearly three years of fairly optimistic promises from economists and government officials alike, no major industrial country has been able to sustain a powerful rise in investment, and the effects have left the worldwide economy only partially emerged from the 1974-75 recession. As investment continues to stagnate and forecasts for the future remain "sobering", Business Week a year later (20 October 1978) has featured another such article, "Capital Spending—Going Nowhere in 1979". This slowing pace of capital investment is itself the result of another important feature of the 1970s—a general decline in the rate of profit. (The rate of profit is the ratio of the profit of a given year to the amount of capital invested. Businessmen often refer to the rate of profit as the "rate of return", since they consider profit to be an "appropriate return" for the money they invest as capital.) A decline in the rate of profit affects capital investment adversely in two ways. Most importantly, profit is the fund out of which investment for expansion is financed. If that fund is reduced, then sooner or later investment must also be reduced. In the second place, profit is the "incentive" for investment—the reason why money is invested in capitalist enterprises. If the rate of profit is significantly reduced, then this incentive is blunted, and the wealthy may choose to spend their money in other ways. It is hard to get reliable statistical information on the rate of profit, mainly because it is calculated differently depending on whether profit is counted before or after taxes, on the precise definition of capital, etc. But all the estimates of the rate of profit during the post-war period exhibit a striking similarity—they all indicate that the rate of profit has declined significantly since the early 1960s. After about 1965, the graphs of the various estimates of the rate of profit all begin to slope downward. To pick one example, Standard and Poors reported recently that the average rate of profit on capital invested in the U.S. fell from around 14% in the mid-1960s to around 9% in the mid-1970s. The decline in profit rates seems to have been even more severe in Europe (as has the decline in investment and the general economic stagnation). Business Week reported recently that one in sixteen of the 750 largest corporations outside the U.S. actually lost money in 1977 (that's a negative rate of profit). Sweden, Denmark, Italy, France, Belgium, and Canada were mentioned as having particularly severe "profit problems". Compared with the rest of the world, Business Week commented, the U.S. looks like a "pocket of prosperity". There has been a basic longterm decline in the rate of return that a businessman can expect from his investment. The rate of return today is simply not much of an incentive for future investment. Investment is lagging for the simple reason that it has become less profitable. . . after-tax rates of return have declined from around 8% in the mid-sixties to around 3% in recent years. We are underinvesting because it no longer pays to invest. Secretary Blumenthal added that President Carter is "acutely aware" of the problem of lagging investment and has "oriented his entire fiscal policy toward solving the problem". The decline in the rate of profit is responsible not only for the slowdown in investment (and the consequent rise in unemployment), but also for the inflation that has increased so dramatically in the 1970s. As the above quotations suggest, businessmen are well aware of and much concerned about the decline in the rate of profit. They are diligently searching for ways to boost the rate of profit back up to what they consider an "adequate return" on their investment. The industrial order of the day is this—whenever you can, raise the price. Businessmen are now rushing to raise their prices because they think they can get away with it and because they see a chance to raise their profits. And with unemployment still high, they expect wages to lag a bit behind. Therefore, an analysis of the economic crisis of the 1970s should begin with an explanation of why the rate of profit has declined. What are the reasons for this trend which limits the expansion of capital investment and which thereby brings on a general crisis ? In attempting to answer this question, it should be remembered that this is not the first time a decline in the rate of profit has resulted in a decline in investment and a general capitalist crisis. Rather, the crisis of the 1970s is the last of a long series of crises that have occurred throughout the last century-and-a-half in all capitalist nations. The Great Depression of the 1930s has already been mentioned. Before the 1930s the periods of downturn did not last as long as the Great Depression, but were, by all accounts, equally as severe in terms of the miseries inflicted on the majority of the population. One of the worst such periods of depression in the U.S. occurred in the 1870s. Historians used to refer to the 1870s as the "Great Depression" before the 1930s stole the name. Between the 1870s and 1930s the U.S. economy was in a depression in at least as many years as it was not. Thus, the history of capitalism has been characterized by what is commonly called the "boom-bust cycle". In every boom, promises are made by economists and politicians that depressions are now "a thing of the past" and that capitalism has entered a new era of "permanent prosperity". But every boom so far has turned out to be just as temporary as the previous one. Sooner or later, every boom has collapsed into yet another depression. In every case, these periodic depressions have been the result of a decline in capital investment brought on by a fall in the rate of profit. Thus, history suggests that there is a general tendency for the rate of profit to fall during every period of capitalist expansion and that this tendency ultimately brings the period of expansion to a halt. The decline in the rate of profit in the postwar period is simply another manifestation of this general historical tendency. Very early in the history of capitalism, Karl Marx recognized this general tendency of the profit rate to fall and its importance for the future of capitalism and for the necessity of a working-class revolution. As the main objective of Marx's theory of capitalism was to explain this general tendency on the basis of capitalism's own inherent dynamics and patterns of development, the next section will briefly review his theory. Marx argued that the fundamental cause of the decline in the rate of profit is that the amount of capital invested in capitalist enterprises tends to increase at a faster rate than the number of workers employed. The ratio of the total amount of capital invested to the number of workers employed Marx labelled the "composition of capital". Marx's theory of the falling rate of profit focuses on the trend of this key ratio—on the increase in the composition of capital. The composition of capital tends to increase during any period of expansion because new labor-saving technology (new machinery, processes, etc. which require less labor to produce the same—or an even greater—quantity of commodities) is continually introduced into the capitalist production process. Capitalist enterprises introduce such labor-saving technology because it lowers their production costs, gives the most innovative firms an advantage over their competitors, and enables them to collect a higher-than-average rate of profit (temporarily, until their competitors catch up with the new technology). This more productive, labor-saving technology usually requires that more and more capital be invested in the materials of production (machinery, raw materials, etc.) for each worker employed. For the economy as a whole, the overall result of this process is that the total amount of capital invested increases more rapidly than the number of workers employed. Since profit is produced by workers (profit is simply the monetary form of the surplus labor of workers), the amount of profit produced in a given year depends primarily on the number of workers employed during that year. Therefore, if the total capital invested increases faster than the number of workers employed (i.e., if the composition of capital rises), then the total capital invested will also tend to increase faster than the amount of profit produced by these workers. In other words, the rate of profit will tend to fall. This depressing effect on the rate of profit of a decline in the number of workers in relation to the capital invested may be partially offset by an increase in the profit produced by each worker. In Marx's terms, an increase in the composition of capital may be partially offset by an increase in the "rate of surplus value" (the ratio of the profit produced by the average worker to the average worker's wage). The rate of surplus value tends to increase as a result of the same process that causes the composition of capital to rise—the continual increase in the productivity of labor due to technological innovation. An increase in productivity reduces the portion of the total working-time of society which must be devoted to the production of goods and services consumed by workers, and thereby increases that portion of the total working-time which can be devoted to the production of profits for capitalists. The "surplus labor-time" is increased, or the rate of surplus-value increases, as a result of the increased productivity of labor. However, as the surplus portion of the working-day increases and takes up more and more of the total working-day, it becomes harder and harder to squeeze out additional surplus labor through increases in productivity. The amount of extra surplus labor-time that results from an equivalent increase in productivity becomes smaller and smaller as the surplus labor-time itself increases. Therefore, it becomes more and more difficult to compensate for an increase in the composition of capital by further increases in the rate of surplus-value. For this reason, Marx concluded that the increase in the composition of capital would sooner or later prevail, and that the rate of profit would tend to fall. The rate of profit falls not because the worker is exploited less, but because altogether less labor is employed in relation to the capital employed. Just as a depression is brought on by a fall in the rate of profit, a return to prosperty requires a significant increase in the rate of profit—an increase large enough to generate another round of rapid capital expansion. How is such an increase in the rate of profit accomplished ? What happens during a depression to increase the rate of profit, thus making possible another "upswing ?" Since the fundamental cause of the decline in the rate of profit is the increase in the composition of capital, the decline in the rate of profit can be reversed only if the composition of capital is reduced. The source of the problem is that the amount of capital invested increases faster than the number of workers employed. The solution to this problem is the reduction of the amount of capital invested—what Marx called the "devaluation of capital" or the "destruction of capital". The destruction of capital is accomplished during a depression by the bankruptcy of large numbers of capitalist firms, which has been characteristic of every depression of the past. When a company goes bankrupt, the owners of the company lose all, or most, of the money they had invested as capital. The overall effect of many companies going bankrupt at the same time is that a significant portion of what counted as capital during the previous boom is simply written off the books. On the basis of very scant statistical information, it appears that the total capital invested in the U.S. was reduced by roughly one-third as a result of the widespread bankruptcies during the Great Depression. Most bankrupt companies are taken over by larger, surviving companies. The purchase price the surviving company must pay for the assets of the bankrupt company is much lower than the capital originally invested in those assets. As a result, the same physical assets, capable of producing just as much profit, now require a much smaller investment of capital. In other words, the potential rate of profit is increased for the surviving companies. Thus, a significant devaluation of capital, accomplished through the bankruptcy of capitalist firms, is a necessary precondition for the restoration of the rate of profit and another round of capital expansion. At the same time, of course, the bankruptcy of capitalist firms is also the cause of much of the misery suffered by the working population during a depression. The devaluation of capital during a depression is accompanied by other developments that serve to increase the rate of profit (i.e., intensify the exploitation of workers) and thereby contribute to the restoration of the rate of profit. The most important of these developments in depressions of the past has been the reduction of wages. Typically, employers would unilaterally announce a 10% or 15% wage cut (and sometimes two or three such cuts if the depression lasted long enough). Employees would then be forced to accept these cuts, or quit and look for another job in the middle of a depression—or go on strike to resist the wage cuts. The most bitter strikes of the nineteenth century were precipitated by attempted wage cuts during years of depression. One such example has come to be known as the Great Upheaval of 1877—a nationwide railroad strike that grew out of a series of wage cuts during the years of severe depression in the 1870s. The strike was finally ended by the U.S. Army taking over and running the trains, despite the armed resistance of the railroad workers. A reminder of this particular strike still stands in the center of most cities in the U.S.—the national guard armories built soon after the Great Upheaval of 1877 in case the Army should have to be used again to put down workers' rebellions. Another tactic used by employers to increase the rate of surplus-value during a depression is commonly referred to as "speed-up" (increasing the quantity of output required of each worker without a change in technology). Of course, this tactic is also practiced in periods of prosperity, but it becomes more widespread during depressions, as employers attempt to avoid bankruptcy by forcing more work out of their employees. Intensive speed-up campaigns were very common in the 1930s, especially in those industries, like the automobile industry, in which production was organized on the basis of an assembly line. In those industries, speed-up was accomplished by simply turning the knob that increases the speed of the line. The "sit-down" strikes and the mass movement for unionization in the auto industry in the 1930s were largely a response to a continuing and brutal speed-up campaign by the automobile companies during those years. This, then, is what Marx's theory tells us about why the rate of profit falls during an expansion and how the rate of profit is increased during a depression. Marx's theory has been confirmed by the history of all capitalist nations, both by the fact that that depressions have happened over and over again, and by the fact that these depressions have ended only after a significant devaluation of capital. What does all this suggest about our current situation, and about the likely course of events in the 1980s ? So far, the economic crisis of the 1970s has been characterized by widespread attempts to increase the rate of surplus-value without, as yet, a significant devaluation of capital. Let's first discuss the attempt to increase the rate of surplus-value. In the 1970s, capitalists have not (yet) attempted to cut wages directly, but have accomplished the same objective by the indirect means of increasing prices faster than wages. This strategy avoids (or rather, postpones) the direct confrontation between employers and employees over wages, and allows the employer to blame the government for inflation. This strategy was first suggested by Keynes in the 1930s. Keynes thought that workers had a "money illusion"—that they were only concerned about the size of their paycheck and would not notice that price increases were eroding the purchasing power of their bigger paychecks. This strategy has been only modestly successful in the 1970s. Contrary to Keynes's expectations, workers have paid close attention to price increases and have attempted to secure wage increases at least as large. Nonetheless, the overall result in most capitalist nations has been that prices on the average have increased 5-10% faster than wages since 1973. For capitalists, this means a small increase in the profit produced by their employees. For the employees, it means a corresponding decline in the purchasing power of their wages. Another somewhat novel strategy used in the 1970s by capitalists in some industries to reduce their wage costs has been to build their factories in areas of the world where wages are very low. This international transfer of capital has been most prevalent in the textile and electronics industries, but recently has increased in such basic industries as steel and shipbuilding. The most popular cheap-labor areas have been Asian and Latin American nations such as South Korea, Hong Kong, Taiwan, Brazil, Mexico, etc. Capitalists in the 1970s have also attempted to increase the rate of surplus-value by the old strategy of speed-up. This goes on behind the scenes and is largely invisible to outside observers. But a lot of evidence—of such actions as increasing the speed of assembly lines, increasing production quotas, reducing break times, eliminating wash-up time, reducing the size of work crews (the main issue in the recent railroad strike), etc.—suggests a general trend toward the intensification of speed-up in the 1970s. One of the most drastic attempts to speed-up the pace of production has become famous for the rebellion it generated—the wildcat strike at the General Motors factory at Lordstown, Ohio in the fall of 1971. This strike was triggered by GM's attempt to increase the speed of the assembly line so that, instead of sixty Vegas being produced every hour, the same number of workers would be required to produce one hundred cars per hour. The wildcat strike forced General Motors to "compromise" at a new speed of seventy-five cars per hour. Attempts to increase the rate of surplus-value by all these means will probably become increasingly frequent and increasingly aggressive in the next few years. So too, no doubt, will the resistance to these attempts by employees who refuse to accept further cuts in their living standards, or who refuse to work still harder. Strikes over wages and working conditions—the traditional form of class conflict within capitalism—will probably become more and more bitter and hard fought in the years immediately ahead. Will these attempts to increase the rate of surplus-value be successful enough to raise the rate of profit high enough to generate another "investment boom ?" History suggests that the answer to this question is negative, that these measures to increase the rate of surplus-value, by themselves, will not be sufficient to end the current stagnation of investment. In every depression of the past, increases in the rate of surplus-value, drastic as they have been in some cases, have never been sufficient to raise the rate of profit high enough to end the depression. Every previous case has required in addition the destruction of a significant portion of the existing capital, by means of the losses and bankruptcies incurred during a depression. Marx's theory explains why increases in the rate of surplus-value are not sufficient to reverse the decline in the rate of profit. The explanation, as we have seen, is that the cause of the decline in the rate of profit is an increase in the composition of capital, not a decline in the rate of surplus-value. Therefore, attempts to raise the rate of profit by increasing the rate of surplus-value involve not the reversal of an adverse trend, but rather the acceleration of a favorable trend. However, there are limits beyond which further increases in the rate of surplus-value become more and more difficult. Wages can be cut only so much, or the pace of work can be increased only so much, before these actions begin to cause a reaction—the resistance of the working population. Therefore, if the decline in the rate of profit is to be reversed, the underlying trend which is responsible for this trend must itself be reversed—the composition of capital must be reduced. This requires, as we have seen, the destruction of capital, which only takes place as a result of widespread bankruptcies of capitalist firms. Thus, Marx's theory (and the historical evidence) suggests that a restoration of the rate of profit sufficient to bring about another upswing in the world capitalist economy is impossible without a prior depression. In other words, Marx's theory suggests that the economic crisis of the 1970s is but a mild prelude to the real depression that lies ahead—in the 1980s. Just as in 1930, the worst is yet to come. One final question needs to be at least briefly discussed: What can the government do about all this ? Can the right kind of government economic policies reverse the slide into depression and make possible another round of capital expansion ? 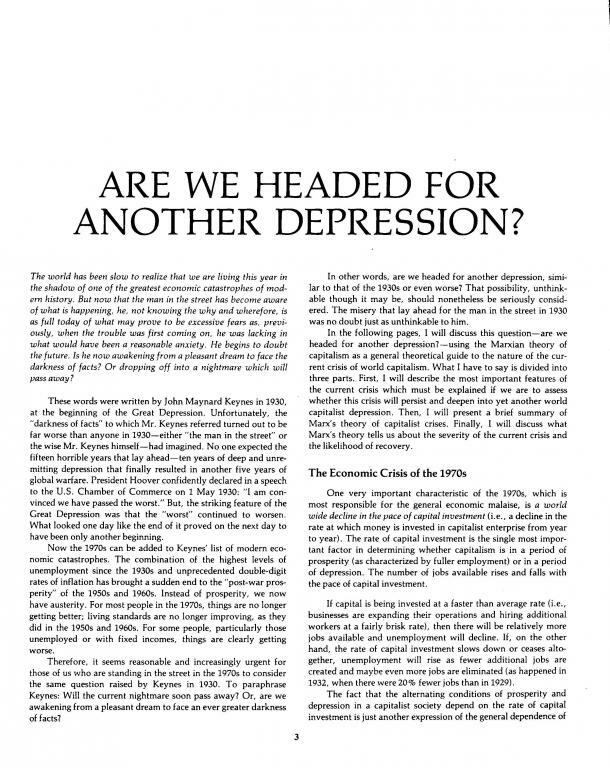 Throughout the 1950s and 1960s, Keynesian economists claimed that the proper use of government economic policies could eliminate forever the danger of a depression. Where are the Keynesians now just when capitalism needs them most ? The Keynesian solution to the problem of depression was essentially this: whenever capital investment slowed down (and unemployment increased as a result), the federal government should take up the slack by increasing its own spending. However, as Paul Mattick pointed out a long time ago, government spending is financed by taxing or borrowing income produced in the capitalist sector. Therefore, an increase in government spending generally requires that a greater portion of the total surplus-value be taxed or borrowed by the government. A correspondingly smaller portion of the total surplus-value is available for investment as capital. As a result, the increase in government spending further aggravates the shortage of surplus-value, which caused the decline in capital investment in the first place, and ultimately leads to a further decline in investment. The negative effect that increased government spending has on capital investment is being emphasized these days by conservative economists, who are suggesting cuts in government spending as a stimulus to investment. However, these conservative economists forget the reason why government spending has increased in recent years—to offset a prior decline in investment. Therefore, cuts in government spending will most likely bring, not a revival of capital investment, but rather, a sharp rise in unemployment. Another problem with the strategy of increased government spending as a solution to the stagnation of investment is that it tends to increase the prevailing rate of inflation. Very briefly, the explanation of this inflationary side-effect of increased government spending is as follows: capitalist enterprises experience the increase in government spending as an increase in their sales, as an increase in the demand for their products. This increase in demand provides these enterprises with an opportunity to increase their profits by simply raising their prices, without the expense and risk required to expand output. (Remember the words of the investment bank quoted above: "Whenever you can, raise the price".) It would be bad business to pass up such an opportunity, especially these days when profit rates are lower than they used to be. We used to think you could just spend your way out of a recession and increased unemployment by cutting taxes and raising government spending. I tell you, in all candor, that that opinion no longer exists. It only worked in the past by injecting bigger doses of inflation into the economy, followed by higher levels of unemployment as the next step. . . the cozy world, which we were told would last forever, where full employment could be guaranteed by a stroke of the Chancellor's pen, is gone. The New York Times reprinted excerpts from this speech with the title, "Mr. Callaghan Talks Business". Therefore, although government economic policies may make it possible (for a while longer) to avoid a sudden and total collapse of the world capitalist economy (like what happened in the early 1930s), these policies will not be able to reverse the downward slide into yet another worldwide depression. This means that the most likely prospect for the next few years is a continuation of the slow, steady decline we have experienced so far in the 1970s. Capital investment will remain stagnant; the peaks and troughs of unemployment will gradually increase; rates of inflation will continue to accelerate; and our living standards will continue to decline. Even this rather dismal, but less than catastrophic, course of events cannot last forever. At some point, galloping inflation will make profitable business so difficult and so uncertain that further investment will stop altogether. Or politicians will decide that accelerating inflation is too high a price to pay for avoiding a depression, and will stop trying to prop up the economy and let the depression happen. Some conservative economists, led by Nobel prize winner Milton ("let's have a real one") Friedman, are already suggesting this course of action. When this point is reached, the bankruptcies will begin and things will suddenly get much worse. Of course, this "purely economic" scenario could, at any time, be interrupted by the Third World War, and that would be "it", as Lenny Bruce used to say. In fact, the gradual slide into depression has already intensified the economic competition among nations, as each nation tries to solve its economic problems at the expense of other nations (by such means as export subsidies, import quotas, "trigger prices", etc.). In the 1930s, such "beggar-thy-neighbor" policies (initiated largely by the U.S.) resulted in a virtual halt to international trade and finally led to the Second World War. The obvious conclusion to all this is that the next decade will probably turn out to be a crucial one in world history. The odds are greater than ever before that it will be the last decade in world history. But there is still the chance that the world's population will become so fed up with the misery inflicted on them by yet another capitalist depression that they will do whatever is necessary to wrest control of the world's productive resources from their present owners and reorganize society with the aim of satisfying their own needs, rather than producing profit for capitalists. Needless to say, we should all direct our efforts toward that end.